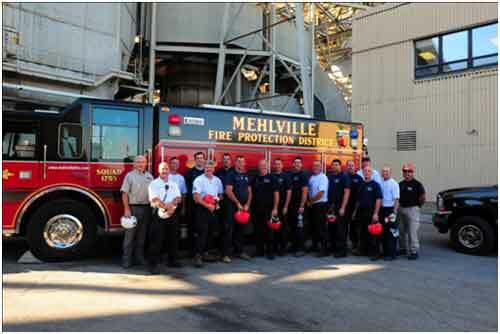 Mehlville Fire Protection District is charged with providing rescue to trapped victims on the bluffs that overlook the Mississippi River as well as those trapped in precarious places in industrial settings. 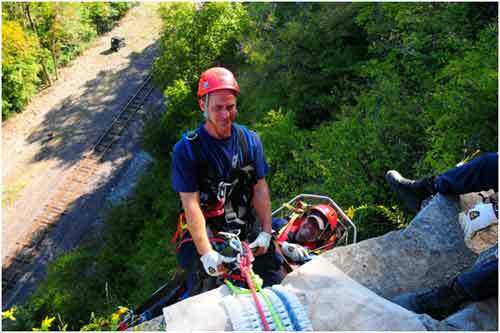 In 2010, the District selected 15 employees for a new Advanced Technical High Angle Rope Rescue Team. Team members drilled together to prepare for a high level, extensive training conducted by CMC Rescue Incorporated, California. 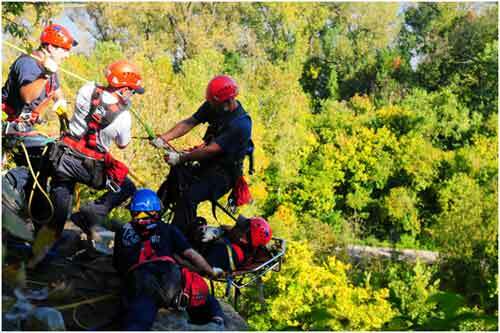 CMC's 40 hour class started off with a refresher of rope rescue techniques and culminated at the Ameren UE power plant on Fine Road where team members rappelled from platforms nearly 200 feet above the ground. Team members were put to the test when asked to hook onto a rope that is only one half inch in diameter and then dangle high over ground to perform rescues. 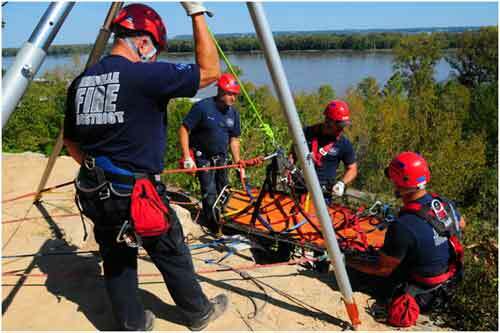 Although the District has been providing these rescues for many years, the Advanced Technical High Angle Rope Rescue Team is able to perform them faster and safer than ever before using very advanced techniques. Personnel descend a bluff near Cliff Cave Park. A team member awaits the next lift from the "haul" team as he brings a victim to safety. Team members manipulate a victim over the edge during training.